New evidence suggests that the famous fossilised human ancestor dubbed "Lucy" by scientists died falling from a great height - probably out of a tree. CT scans have shown injuries to her bones similar to those suffered by modern humans in similar falls. The 3.2 million-year-old hominin was found on a treed flood plain, making a branch her most likely final perch. 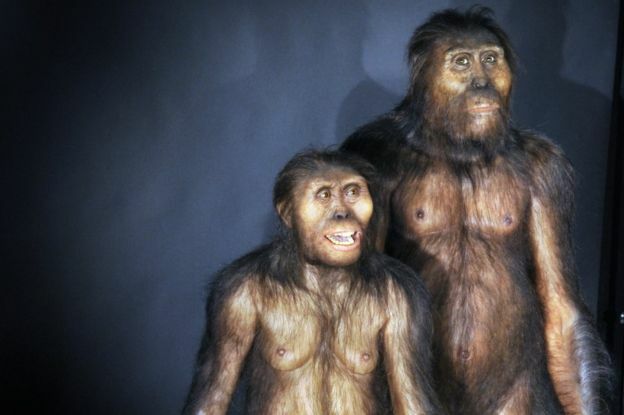 It bolsters the view that her species - Australopithecus afarensis - spent at least some of its life in the trees. Writing in the journal Nature, researchers from the US and Ethiopia describe a "vertical deceleration event" which they argue caused Lucy's death. In particular they point to a crushed shoulder joint, of the sort seen when we humans reach out our arms to break a fall, as well as fractures of the ankle, leg bones, pelvis, ribs, vertebrae, arm, jaw and skull. "We weren't there - we didn't see it - but the subset of fractures that we've identified are fully consistent with what's reported in a voluminous orthopaedic surgical literature about fall victims who have come down from height," said lead author John Kappelman from the University of Texas at Austin. "It's tested every day in emergency rooms all around the planet." Discovered in Ethiopia's Afar region in 1974, Lucy's 40%-complete skeleton is one of the world's best known fossils. She was around 1.1m (3ft 7in) tall and is thought to have been a young adult when she died. Her species, Australopithecus afarensis, shows signs of having walked upright on the ground and had lost her ancestors' ape-like, grasping feet - but also had an upper body well-suited to climbing. The bones of this well-studied skeleton are in fact laced with fractures, like most fossils. But with modern tools such as high-resolution CT scanners, researchers can start to unpick which ones were injuries and which ones happened during the intervening millennia. "These fractures have been known since she was discovered," Prof Kappelman told BBC News. "I've looked at this fossil for 30 years and I knew that these fractures were there." It was during a brief break in Lucy's 2008 tour of US museums that he and his colleagues found time for the scans. "We were able to get permission from the Ethiopian government… and after the exhibit closed down in Houston, we brought Lucy here to the UT campus - in secret, for security purposes. And we have a high-resolution CT scan here. "We scanned everything. We worked 24/7, 10 days straight without a break." Without those precious scans, Prof Kappelman said, Lucy's injuries would never have come to light. "What it allows us to do is literally look inside mineralised rocks and bones. And Lucy - as much as we love her - she's a rock. She's fully mineralised." By peering inside the bones in minute detail, the scanner showed that several of the fractures were "greenstick" breaks. The bone had bent and snapped like a twig: something that only happens to healthy, living bones. A fatal fall also fits with the fact that Lucy's tiny first rib is broken. This bone is small and heavily protected, Prof Kappelman explained; if it's fractured, you're having a bad day. "When you look at rib fractures, the first rib is the most rarely fractured. It take a high amount of chest trauma." But the shattered top of the fossilised humerus bone - Lucy's upper arm - is the most compelling piece of the puzzle. "If our hypothesis stands up… it tells us that Lucy was conscious when she reached out her arms to break her fall," said Prof Kappelman. The researchers even used their scans to 3D print Lucy's humerus and discuss it with orthopaedic surgeons. So far, they have all agreed. "At this point I'm nine from nine," Prof Kappelman said of his blind tests on unsuspecting bone doctors, adding that he printed out the bones in an enlarged form so that they appeared human. "Everybody agrees this is a fall from height."